From collages through to paper craft, our Crepe Paper packs are sure to become a favoured addition to your Arts & Crafts resources. 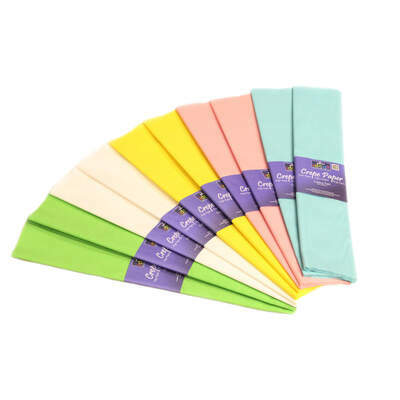 Suitable for all ages, they are provided in an assortment of soft pastel colours - ideal for creating Spring-inspired projects or crafting Princess-style outfits for dolls. Crepe paper is one of those supplies that can be used for a host of different crafts. Create 3-dimensional flowers to decorate gifts, make lanterns to explain the way light passes through or stuff into present bags for that final touch. It can be cut and glued easily while being compatible with all different types of adhesive. Give them another tool to support their imagination and watch them craft to their heart's desire. We have a wide variety of different paper products available at wholesale prices. From standard A4 White Paper through to Tissue Paper Packs, we'll give you exceptional wholesale prices.